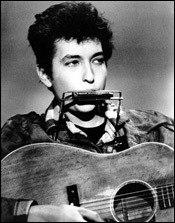 This weekend marks the final installment of my Dylan Weekend series. Certainly Bob Dylan has produced enough material to keep this going pretty much forever, but I feel that I’ve covered a wide enough range of his output to do some justice to the man in my own small way, and it’s time to look elsewhere. 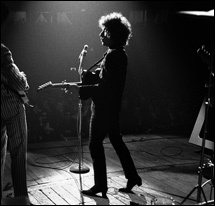 I started the series back on January 30 with ‘You’re No Good,’ the first song on Dylan’s first studio album. Tomorrow’s track will be the 70th Dylan Weekend song I’ve featured since then. Over that span, I’ve posted songs from 34 studio albums and six bootleg collections. Time Out of Mind is without question one of Dylan’s finest albums of the last few decades, but the tracks on Telltale Signs that were left off the album could have combined to make it the best by a mile. One of those is ‘Red River Shore,’ which I mentioned yesterday. Another is ‘Marchin’ to the City,’ a passionate blues number. And Dylan’s classic ‘Mississippi,’ which eventually found a home on Love and Theft, was originally recorded in a much different form for Time Out of Mind. 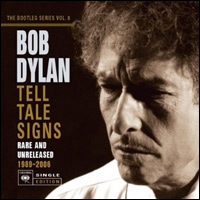 It’s hard to pick a favorite among the volumes of the Bootleg Series, but I might cast a vote for Volume 8, Telltale Signs, a collection of rare and unreleased material recorded between 1989 and 2006. 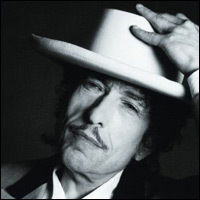 During that span, Dylan released Oh Mercy and Under the Red Sky, followed by his folk music cover albums and then the celebrated trilogy of Time Out of Mind, Love and Theft and Modern Times. He was at a creative peak, especially from the late 90s on, and Telltale Signs makes it clear that, as usual, many special songs never made it onto those albums. Among those is ‘Red River Shore’ (covered on the blog in early 2009) that maybe ties ‘Blind Willie McTell‘ as the best song ever left off of a Dylan album. As I mentioned yesterday, Volume 7 is in some ways the weakest of the Bootleg Series because it falls back mostly on songs that are already known. 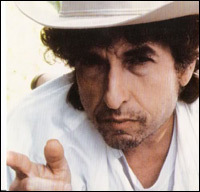 In fact, it breaks a cardinal rule of bootlegs in general by including material that has already been released — Dylan’s ‘Song to Woody,’ which appeared in the same form on his debut album, and the live Royal Albert Hall versions of ‘Ballad of a Thin Man’ and ‘Like a Rolling Stone,’ which had not only been released but been released on this same Bootleg Series just two volumes back. 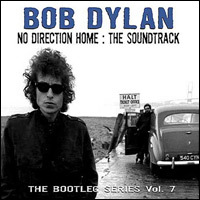 Volume 7 of Bob Dylan’s Bootleg Series is a companion soundtrack to Martin Scorsese’s documentary No Direction Home: Bob Dylan and, as such, has less to offer than the previous volumes I’ve covered on the blog. The songs here are mostly unreleased versions of old classics (either live, demo or alternate takes). But despite its not being a treasure trove of new material, this 2-disc set does offer some illumination into Dylan’s early work. I’ve read comments from Dylan fans along the lines of “If I had access to a time machine, the ‘Royal Albert Hall’ concert is the moment in history I’d revisit.” As for me, I’d probably opt for sometime during the Roman Empire, but I can appreciate the sentiment. Certainly it would have been something to watch this concert live, both for the music and the history.